As you may recall, back in February 2011, Caleb Denison of Digital Trends reviewed the Anthem MRX 700 and called it "Every Bit an Audiophile's A/V Receiver". 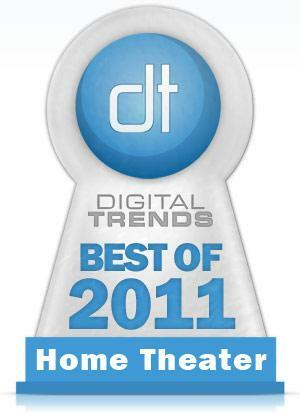 It appears the love for the MRX 700 has not been forgotten, as Digital Trends just released their "Best of 2011 Awards" and the MRX won "Best A/V Receiver" in the Home Theater category. "The Anthem MRX 700 earned its spot on our best-of 2011 list based almost entirely on its sound quality. While other manufacturers are cramming every feature they can into a single box, Anthem sticks to the simple art of making a great-sounding piece of equipment, leaving the Internet streaming tricks for a component better suited to the task... While the MRX 700 faces pretty stiff competition from A/V receivers like Pioneer Elite’s SC-57 receiver, it holds its position due to its warm, powerful and revealing sound quality"
Click here! to see the full list of Digital Trends "Best of 2011"
award winners in the Home Theater category.